I have a much hoped for update. Since starting my degree at Surrey Uni I've been harping on about this problem. The fact that one of my tutors is now the guy running Butser helps! Anyway, the old regime is dead and the new regime (which loves dogs) has relented! The Dog Ban has been lifted (though sadly not during the burning) and canines on leads are once more welcome at Butser. Well done, Steve! As usual, we bought tickets to this years burning of the Wickerman, even bringing along friends to join us. 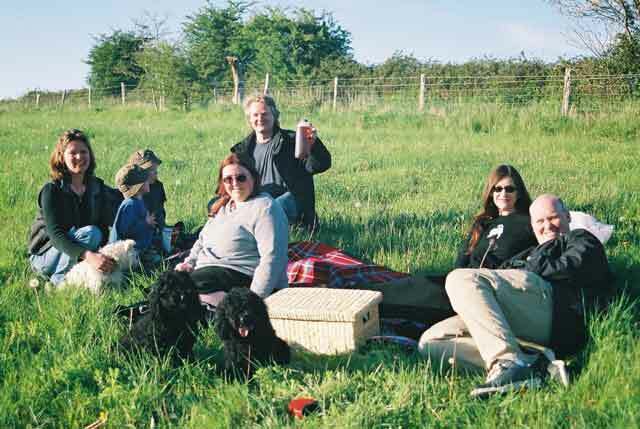 We organised a picnic, had kids packed in the car and our dogs with us...as usual. However, things would be a little different this year. Below is reproduced my letter to Butser. Anyone with any comments can contact me via my feedback page by clicking here, or contact Butser directly at the address on the letter. As our picture below shows, we still had a nice picnic!